Postal security refers to the safeguarding of United States Postal Service (USPS) employees and customers from hazardous materials that may be contained in the mail. In October 2001, pieces of mail containing the anthrax bacterium infected 23 persons, five of whom died. The USPS immediately took measures to insure the safety of its employees and customers. Furthermore, the USPS developed a plan to safeguard the mail system and protect employees and customers without compromising the level of mail service. Because of the complexity of the USPS system and volume of mail that is processed, achieving postal security is no small undertaking. The postal service handles nearly 680 million pieces of mail each day. The USPS has about 300 processing and distribution centers that use computer-controlled sorting equipment and data processing systems to distribute mail to its destination. The Emergency Preparedness Plan was developed to protect USPS employees and customers from future bioterrorism attacks. The Plan is composed of six initiatives: prevention, protection and health-risk reduction, detection and identification, intervention, decontamination, and investigation. Each initiative is a point where actions can be taken to reduce the risk or effects of bioterrorism. Prevention. The first initiative is to reduce the risk that a person could use the mail as a vehicle for bioterrorism. 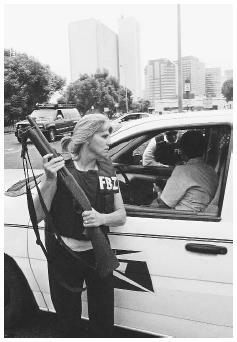 FBI agents check the identification of a postal worker seeking to enter the Federal Building in Los Angeles as security measures were tightened coast to coast after the terrorist attacks of September 11, 2001. The addition of detection, containment, and sterilization technologies to the 350,000 mail collection boxes in use is not yet feasible. The USPS has been investigating the use of intelligent mail in which each piece of mail has a unique identifier. This measure would reduce anonymous mail. Protection and health-risk reduction. This initiative's objective is to reduce the risk that USPS employees and customers could be exposed to biological weapons and to prevent contaminated mail from contaminating other mail. USPS employees can wear protective equipment. Mail-processing machinery could be cleaned with high-efficiency particulate air (HEPA)-filtered vacuum systems. Enhanced heating, ventilation, and air-conditioning (HVAC) systems could be used to trap or kill bacteria in the air. As of late 2002, the application of HEPA-filtration technologies to the mail system is still being investigated. Detection and identification. The objective of the third initiative is to detect and identify biological weapons as early in the mail stream as possible. This initiative involves two technologies: triggering and confirmation. Triggering technologies would provide continuous monitoring of the mail and report the presence of a possible threat. Confirmation technologies would detect the presence of specific microorganisms. Application of these technologies to the mail system is still under investigation. Intervention. Routine decontamination of mail is a precautionary measure. The possible methods for mail decontamination work by exposing mail to radiation (eg. ebeams), high pressure, or gases. Microorganisms, such as the anthrax bacterium or spore, cannot survive these conditions. In 2001, the USPS bought eight e-beam machines and planned to install them in Washington D.C. and the New York and New Jersey area. As of late 2002, irradiation is the only acceptable method for decontaminating mail, and e-beam technology has been used to sterilize incoming federal government mail only. Decontamination. This initiative refers to the elimination of known biological weapons in the mail, mail processing equipment, and buildings. The decontamination processes described for the intervention initiative can be applied to sterilize mail that is known to be contaminated with dangerous microorganisms. Certain gases have anti-microbial properties and are used for disinfection and sterilization. Chlorine dioxide was used to disinfect an office building that was contaminated with anthrax spores. Investigation. This initiative aims to enhance criminal investigation methods as related to postal security. Technologies consistent with this initiative include mailpiece tracking and tracing using a Wide Field of View camera, image capture and analysis, and positive product tracking. These technologies would enable the USPS to track contaminated mail and equipment. "Months After Anthrax Scare, Mail-Safety Goals are Unmet." USA Today. (August 29, 2002):12a. Rhodes, Keith A., "USPS Air Filtration Systems Need More Testing and Cost Benefit Analysis Before Implementation." FDCH Government Account Reports (August 22, 2002). United States Postal Service. < http://www.usps.com/welcome.htm > (January 1, 2003).